As another year comes to a close, I have taken a moment to reflect on the last 12 months and be able to recognize with gratitude how far we have come in so short a time. 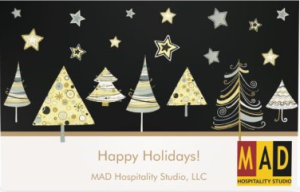 This past year has brought amazing opportunities to work on a variety of wonderful projects as well as being able to network with the best and the brightest of the Hospitality industry. As I look into the portal of 2014, I see a bright and busy future with exciting new projects and we look forward to providing design excellence in Hospitality! We wish you and yours a very Happy Holiday Season and Best Wishes for the New Year!